The Ducks split up this past weekend, sending a squad to the Oregon State University High Performance Meet while another group was sent down to Stanford for the Peyton Jordan Invitational. Over at OSU, the Ducks took wins in many events. Waverly Neer, a transfer from Columbia, made her first appearance in an Oregon uniform and won the 5000 meter race in 16:12.24. Ashley Maton closed her race well, running a 68 second-to-last lap and finishing the 1500 in 4:25.34. Right behind her were teammates Nikki Hiltz (4:26.14) and Katie Porada (4:26.27). In the women’s 800, Skylar Evans of Oregon clinched the blue ribbon in 2:10.09 after leading nearly the whole race. The womens 100 meter hurdles came down to the wire when Oregon’s Sasha Wallace and Portland State’s Jazmin Ratcliff finished neck and neck in 13.78. After further review, the results showed Ratcliff won the race by the skin of her teeth. In the women’s high jump the Ducks technically had another winner in Chancey Summers. 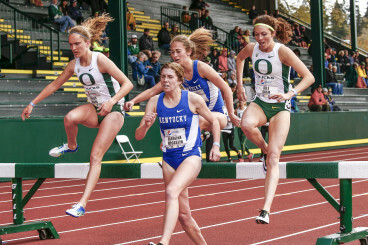 While she was out-jumped by Alison Wood, Wood was not competing for a school but rather the Oregon Track Club. Summers cleared 1.66 meters on her first attempt, winning the collegiate title though not clearing Wood’s 1.71 meter height. Brittany Mann beat her personal best from last year by a hair in the hammer, throwing 57.37 meters, compared to her previous best of 57.30 meters. On the mens side, Darland Jackson won the 3000 meter steeplechase in 9:03.96, beating his opponent from Middle Tennessee State by five seconds. Ben Thiel won his 400 meter hurdle race in 53.95 seconds and Trevor Ferguson won his 110 meter hurdle race by over a full second at 14.33. All three races were resounding wins by the Ducks. Ryan Hunter-Simms won the discus with a throw of 54.81 meters and placed third in the shot put, throwing 18.30 meters. It was a great showing for the Ducks at OSU, but seven of the top Ducks went to Stanford to compete and they did not disappoint. Six came out with new personal bests in their respective events. Molly Grabill, with perhaps the most impressive showing, ran a personal best of 15:47.69 in the 5000 meters, dropping close to 50 seconds from her past best. That time puts Grabill at No. 7 on the Oregon all-time best list. Grabill’s teammate, Maggie Schmaedick, ran in a separate section and placed fourth, setting a personal best of 16:09.76. Frida Berge and Alli Cash both ran the 3000 meter steeplechase. Berge placed fifth in her section, running 10:19.21. That time moved Berge from seventh on the Oregon all-time list to sixth. Cash crossed the line in 14th place, just missing her all-time best of 10:30 by one second. In the mens 5000 meter, Jake Leingang blasted his last year’s personal best of 14:11.34 to pieces by running 13:46.64 and placing fourth in his heat. In the mens 1500, the Ducks’ former indoor mile school record holder Daniel Winn and true freshman Blake Haney took the stage. Both ran superbly and dropped nearly three seconds from their best marks. Haney crossed the line in third place in his section, running 3:41.27, while Winn dropped to a 3:39.76 and came in fifth. 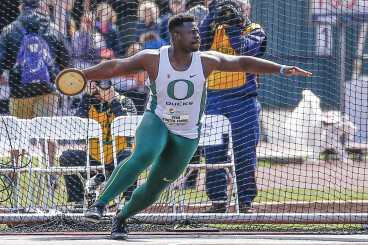 The Ducks performed extremely well at both meets and are looking to continue their success all the way to the NCAA Outdoor Championship. The next meet for the Ducks is the Oregon Twilight this Friday.